A delicious recipe for healthy popsicles made with only 4 ingredients! 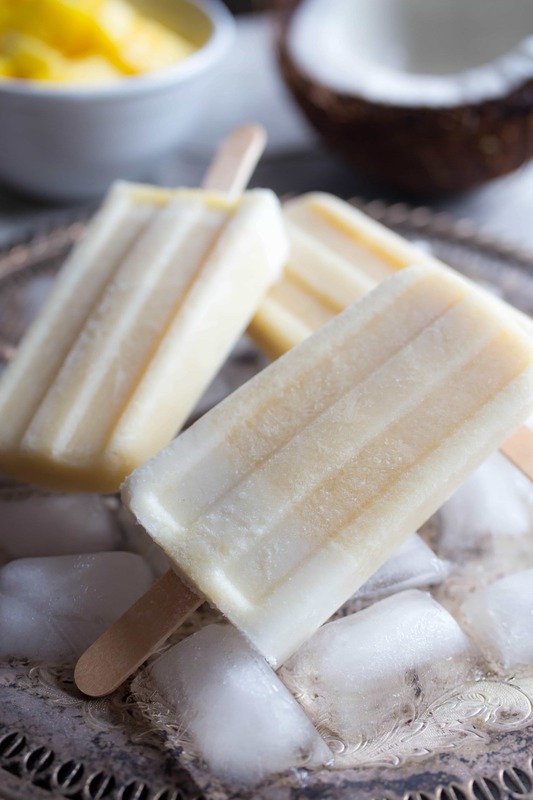 These all natural Coconut + Caramelized Pineapple Popsicles are dairy free, gluten free, and vegan. It’s the most wonderful time of the year… POPSICLE WEEK!!! Last year for Popsicle Week 2016, I was all about booze and chocolate with these Nutella Espresso Rum Popsicles. 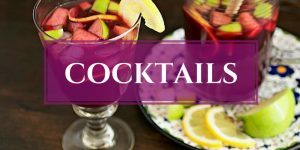 This year, I’m all about healthy popsicle recipes and kid friendly recipes because, as I realized the other day, most of my treat recipes have booze in them and the kiddos don’t seem to like that for some reason. Well kiddos (and adults too! ), here are some popsicles just for you. And they taste so yummy, you won’t even know they are healthy. 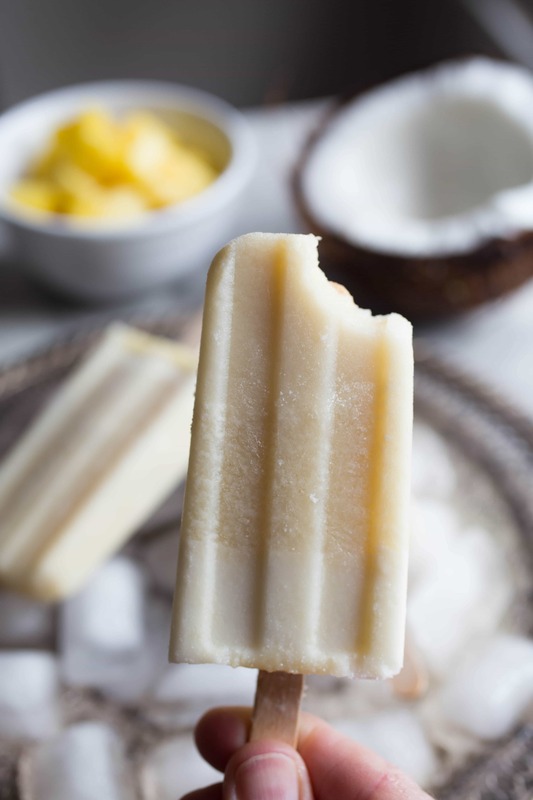 Coconut + Caramelized Pineapple Healthy Popsicles are an all-natural frozen sweet treat the whole family will love. They are also vegan, gluten free, and dairy free, so there’s really no excuse as to why you shouldn’t be making these pops every day this summer. 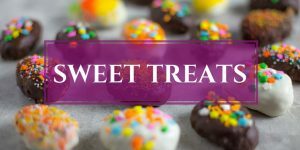 It’s the best vegan dessert recipe around too! Put some fresh diced pineapple and sugar in a pan to caramelize for 10 minutes. Combine the cooled caramelized pineapple in a blender with a can each of coconut cream and coconut milk and a little vanilla, then take it for a whirl in a blender. 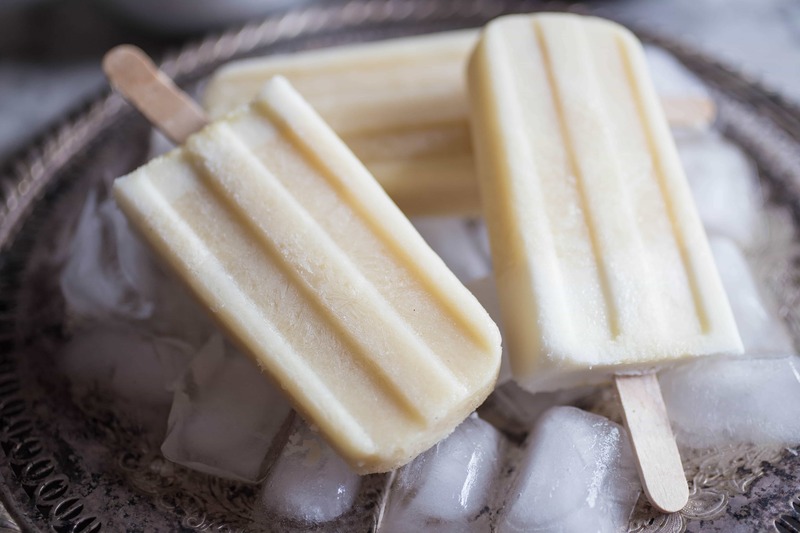 Pour blended coconut and pineapple mixture into a popsicle mold and freeze for a few hours. I use this Norpro Frozen Ice Pop Maker and it’s hands down the BEST ice pop mold I’ve ever used! DONE!!! Now you have a bunch of delicious popsicles to enjoy! 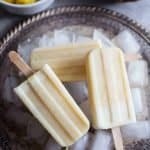 I LOVED making a healthy dessert recipe with these Coconut + Caramelized Pineapple Healthy Popsicles and participating in yet another Popsicle Week. Also, a huge THANKS to Billy at Wit & Vinegar for coordinating this annual event and thanks to all the Bloggers who have brought us all those delicious recipes. 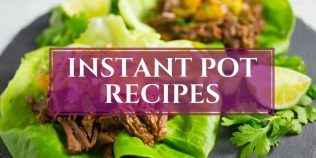 In a large pan, combine the pineapple and the demerara sugar and cook over medium-high heat, stirring occasionally, until pineapple lightly browns and sugar caramelizes (about 10 minutes). Remove pan from the heat and allow mixture to cool. In the meantime, combine the coconut milk, coconut cream and vanilla in a blender and process on high for a few minutes to fully incorporate and break up the coconut fat solids. Add the cooled pineapple to the coconut mixture and pulse a few times to incorporate but keep some pieces of pineapple intact for a chunky fruit popsicle or blend thoroughly on high for a smoother consistently. Pour the blended mixture into the popsicle mold, cover with the top, and add the popsicle sticks. Freeze until firm for about 4-6 hours. To remove from the molds, run warm/hot water over the molds to help loosen. 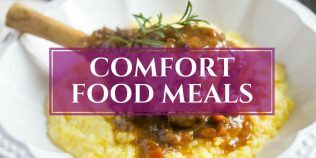 Enjoy immediately or store leftovers covered in the freezer for up to 2 weeks. Store leftover popsicles, covered in the freezer, for up to 2 weeks. 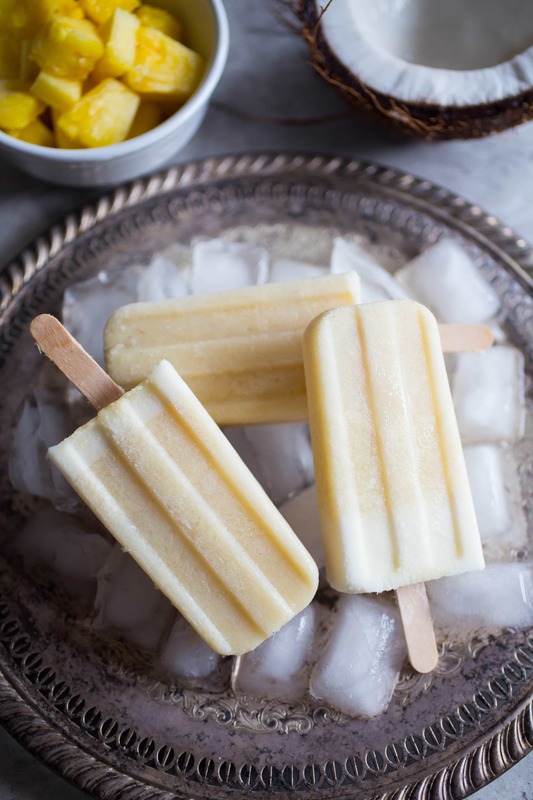 I adore coconut anything and these coconut caramelized pineapple popsicles look so pretty and delicious. Love these healthy popsicles are dairy free, gluten free, and vegan. I love these popsicles because they are all about the coconuts (and pineapples) and coconuts!! They are picture perfect! Definitely going on my list of things to try this summer. Pinned. 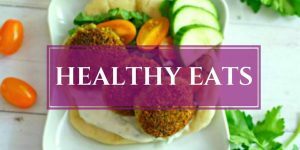 I am loving the flavors in these – healthy or not:) especially the caramelized part. Perfect for handing out as dessert at grilling parties. Sign me up! Karrie!! creative minds think alike!! this week I posted a caramelized pineapple dessert! and I come by and you have also publish with caramelized pineapple!! hehehehe Loving these popsicles! they scream summer! I love coconut and pineapple!! These popsicles are great! From their lovely color, to the texture and flavor! We have the same mold, it works wonderfully! 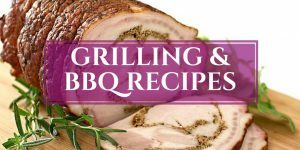 Great summer recipe, or year long to enjoy! Happy -almost- weekend, Karrie! Karrie, I don’t mind popsicles with booze so you can send me everything in case you have some leftovers (hard to imagine though). This combo of coconut and pineapple is so lovely. But you know what? What about adding some rum or even Malibu next time? OMG I LOVE LOVE LOVE this caramelized pineapple business! I want to eat these popsicles all day long. All that coconut and pineapple sounds like a pina colada. 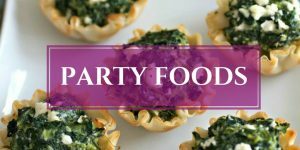 I can have these for breakfast then make some boozy ones for after lunch because I do not have to worry about boozing up any kiddos! My hubby is obsessed with caramelized anything, so these would get him super excited. Such a yummy flavor combo for summer. Cheers, Karrie!! You are right! We should enjoy popsicles all year long! Love this coconut pineapple combination! Such a great flavor combination Yum!